Peter Voss "It began as a cautious policy. In 1950 Sweden was one of the richest countries in the world. The total tax burden was still just 19 percent of GDP—lower than in the United States and in other European countries. It did not surpass 30 percent until 1965. It was an open economy with a small government that produced these amazing results, with a little help from having stayed out of two world wars. In his history of economic policy in Sweden, economist Johan Myhrman concludes that despite a growth in government, these policies continued: Under this period (1950-70) Sweden had a liberal trade policy, which meant low tariffs and a benevolent attitude to business, for example with a tax policy that admitted very generous deductions for capital costs.9 Yes, Sweden today has another reputation. But that came later. In the 1970s, with coffers filled by big business and heads filled with ideas from the international turn to the left, the Social Democrats began to expand social assistance and regulate the labor market. Public spending almost doubled between 1960 and 1980, rising from 31 percent to 60 percent of GDP, and high taxes accompanied them. For a while Social Democrats could travel the world and talk about how they were able to have both big government and high incomes—but only for a time, because this was also the moment when the model began to run into problems. The average growth rate was halved to 2 percent in the 1970s, declining further in the 1980s, and that was before the big crisis in the 1990s. The currency had to be devalued five times to keep industry competitive, by a total of 45 percent. In 1990, the year before a serious economic crisis in Sweden, private enterprise had not created a single net job since 1950, but the public sector had increased by more than a million employees." 1. One resource is missing - land and the income derived from it - rent. 2. The income derived from labour is wages. 3. The factor and product markets. 4. Some of the counter flows. The classical economics of Adam Smith, David Ricardo, and their followers focused on physical resources in defining factors of production. Lately other authors have included others - the most notable being entrepreneurship. So here they are: Land or natural resource — naturally-occurring goods like water, air, soil, minerals, flora and fauna that are used in the creation of products. The payment for use and the received income of a land owner is rent. The remuneration being wages. The capital stock — human-made goods which are used in the production of other goods. These include machinery, tools, and buildings. The remuneration is interest on the capital expenditure. Money as such is not considered to be a factor of production in the sense of capital stock since it is not used to directly produce any good. Then we have entrepreneurship - the remuneration being profit. 112. Where are the slides? I will be placing some guidelines here regarding the completion of the Economics 1B Assignment. 1.1 Which one of the following is NOT an objective of macroeconomic policy? page 7 of the Mancosa study guide is clear about what constitutes Macroeconomic Policy. 1.2 Which of the following is defined as a leakage from the circular flow of income and spending? 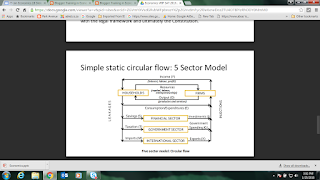 Slide 51 from the first lecture will give you enough information - make sure that you understand the slide and draw it for your general understanding and obvoiusly for exam purposes.Have a look at the slide showing the 5-sector circular flow used in the first lesson. it clearly shows the leakages and injections. 1.3 Which of the following statements about the measurement of GDP is/are INCORRECT? c) Statements 1 and 3 only. d) Statements 2 and 3 only. e) Statement 1 and 2 only. a) is undertaken solely to regulate the level of spending. b) increases with investment because investment increases the size of the tax base. c) is taken to be autonomous because it is subject to government policy. d) can be ignored because investment is taken to be the key determinant of income. e) is determined by the level of tax revenue. a) Candase wants the product that Aliya has. b) Aliya has a good to exchange with Candase. c) Candase is satisfied with the product that Aliya has to offer. d) Candase and Aliya each have a product that the other person wants. e) Aliya has the product that Candase wants. The phrase double coincidence of wants was used in Jevons (1893). "The first difficulty in barter is to find two persons whose disposable possessions mutually suit each other's wants. There may be many people wanting, and many possessing those things wanted; but to allow of an act of barter there must be a double coincidence, which will rarely happen." a) can produce more cotton than South Africa. b) specialises in cotton production. d) consumes more cotton than South Africa on average. e) can produce more cotton than South Africa with a given amount of resources. 1.8 Which one of the following is a possible cause of cost-push inflation? a) An increase in government spending. b) An increase in the oil price. c) An increase in consumption spending. d) An increase in investment spending. e) An increase in export earnings. a) an appreciation of the rand relative to the kwacha. b) a depreciation of the rand relative to the kwacha. c) an appreciation of the kwacha relative to the rand. d) that it will cost South Africans more to visit the Zambia. e) an appreciation of the kwacha relative to all major currencies. I would strongly advise that you read the sections in the textbook relating to the various types of unemployment. The learners were given a scenario (case study) on Greece and then asked to identify the “root cause of the current crisis” I believe that the question should have been broadened so as to be able to tap other knowledge the learner may have regarding the economic problems that many countries have – especially those in the developing world. · Greece gained their freedom in 1830. Many developing countries have only gained their freedom from colonial powers in the last century – and that has certain economic implications. · Greece has borrowed extensively. Many developing countries have huge foreign debt – often because of military expenditure, often for capital projects; but huge sums have been withered away through the corrupt actions of political leaders. The point is that they have debt which have been reduced through debt standstill agreements, but many have not been able to escape the burden. · Greece has managed to be in positive territory with regards to GDP growth for many years, which shows that it is possible. The financial crisis has had a detrimental effect however. For many developing countries the world economic crisis has had a negative impact since most of them are very reliant on commodities and the prices of these have fallen dramatically after the crisis. · Greece’s economy is service oriented. Developing countries could benefit more from providing a haven for financial services and tourism if they were able to stabilize politically and ease their tax regimes and develop appropriate infrastructure. · Greece’s economy is linked to the Eurozone and Euro currency regime. Many developing countries are in the fortunate position that they have their own currencies and can use the fact to establish trade and political relationships with other developing economies like China. India, Russia and Brazil more easily. · It is bad policy for any country to let inflation get out of hand (more than 2%); the effects are multiple – Greece experienced it; so do many developing countries – the best example being Zimbabwe. Inflation is one of the most devastating results of an economy that does not contain its money supply and allows social upheavals (such as the land grab policies in Zimbabwe – which caused food shortages and other social ills) to beset the country. · In many other countries that have gone the Central Planning and Socialist route such as Greece at some stage, one will get a burgeoning public sector and a decline in wealth creation in the private sector. Such policies have had negative effects in many countries in Africa (South Africa for example) and in some South American countries. Examples of turnarounds from such policies towards open free market economies have been China, India, Vietnam and others. Myanmar is also set to go the growth route as a results of the changes taking place but a country such as North Korea is doomed to perpetual poverty as a result of the economic policy route being followed there. · Corruption, obtaining a personal gain from a position of power, makes the free interaction necessary for honest non-coercive market transactions difficult and is a huge impediment to economic growth. This has been the bane of the Greece economy and of many other developing countries. The rule of law as opposed to the rule of men is one of the cornerstones of a thriving market economy. · Arms deals that have the result of benefitting the politicians was a cause of some of the financial woes of Greece. It has also been a problem in many other developing African countries, including South Africa. · Investing in the Olympic Games in 2004, money that Greece could ill afford, contributed to the debt problems. Was the investment in stadiums in 2010 the best use of our scarce financial resources? Or did the benefit in “Nation Building” and “putting SA on the map” compensate. I doubt. The problems faced by Greece is a good example of the effect that the flipside of economics, namely politics, has on the long term wellbeing of a nation. Politics is the nothing else than the use of force to attain some unearned benefit, whereas economics – the free market version that is – is focused on the creation of wealth through production and trade. In economics, total-factor productivity (TFP), also called multi-factor productivity, is a variable which accounts for effects in total output not caused by traditionally measured inputs of labor and capital. If all inputs are accounted for, then total factor productivity (TFP) can be taken as a measure of an economy’s long-term technological change or technological dynamism. TFP cannot be measured directly. Instead it is a residual, often called the Solow residual, which accounts for effects in total output not caused by inputs. A Mancosa Learner should be ready yo answer the following question (as it appeared in the January 2016 B.Com/BBA Eco 1B supplementary examination: "Describy ANY THREE (3) sources of economic growth of an economy. Economic growth is the continuous improvement in the capacity to satisfy the demand for goods and services, resulting from increased production scale, and improved productivity (innovations in products and processes). Another definition is: "an increase in the amount of goods and services produced per head of the population over a period of time."  Factors improving productivity are particularly important sources of growth for developed economies with mature industries, but facing increasing global competition and rapid technological progress.  Consumption has made a strong contribution to the growth of UK demand in recent decades, but the negative impact of the global financial crisis on consumer expenditure will persist for some time. Business investment is likely to become an increasingly important driver of growth. The UK’s net trade position is expected to improve.  Specialised and knowledge-intensive service and manufacturing sectors are likely to contribute strongly to future growth, building on the UK’s relative specialisation in Finance, Business Services, Communications, and Computer and Information Services.